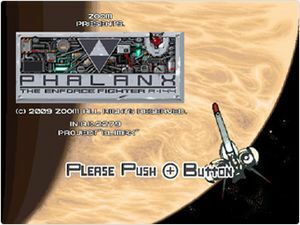 Phalanx (ファランクス) a remake of the shooter from X68 computers. Get fired up! This is the fastest phaser-fight in the galaxy! Put your finger on the trigger! We're about to blast you into the next dimension of special effects - in the fastest star - fighter ever created. You're flying into the zone of fire. Through the deadly bio-cave. Down to the very core of the planet. Firing your missiles a mile a minute at thousands of beastly bio-weapons that are trying to eat you alive. We're talking certain doom - in 3D! And no matter how many big buggers attack you, the action never slows down. So buckle up, and blast off! The graph below charts the compatibility with Phalanx since Dolphin's 2.0 release, listing revisions only where a compatibility change occurred. This page was last edited on 26 January 2018, at 12:27.